The sixth graders enjoyed a variety of activities during the late fall and through the early winter. November began with a chilly morning visit to Grant Brook where the kids each hid a grape in the hopes that it would “survive” the cold or predation over the ensuing weeks. In early December, we went back to Grant Brook to retrieve our grapes. Only four survived! It was a rough month in the wild! We made a third trip to the woods at the end of January. This was a few days after the heavy rains we had. To our surprise the brook had significantly changed course! It was a very cold day, but when we measured the temperatures under the snow we discovered that as we dug deeper the temperatures got warmer. The temperature at the soil surface was barely freezing. During the weeks following the Christmas break the children investigated forces and moving objects. They studied the relationship between gravity and inertia by timing the rate of fall of different sized steel balls from a height of two meters. The balls always fell at the same rate! A video of an astronaut dropping a feather and a hammer on the Moon reinforced this concept. We discussed the force of gravity and how the pull of the moon causes tides. The children determined that force is a push or a pull and that there are basically three types of motion. 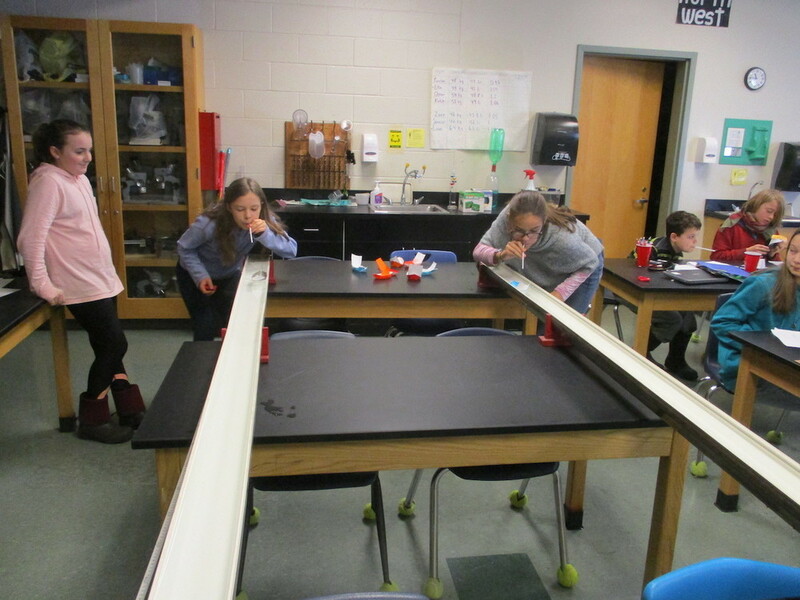 Other ways that the sixth graders investigated motion were with origami boat races, building and racing balloon powered cars, and observing how the action of paddle wheels causes a reaction of forward motion in a paddle boat. Mr. Pendleton demonstrated how important inertia is by dropping an egg into a glass of water by knocking out the plate between the egg and the glass. In mid January the Four Winds volunteers helped introduce a weather unit with a series of activities on air. Through these activities and other investigations and demonstrations, the children discovered that air has mass and takes up space. Air really “matters” when you study weather. Currently, the sixth graders are studying weather instruments, weather technology, and forecasting.